Kerala backwater tours are most commonly associated with houseboats - huge converted rice barges famous on the backwater tourism scene. However, this is only one of the many types of craft on the lakes, rivers and canals that make up the Keralan backwaters. Plenty of other options for travel exist, all of which are substantially cheaper and possibly more environmentally friendly. If you want to see the backwaters, but do not want to blow your budget, read on to find out some good alternatives to the houseboat packages. Alappuzha/Alleppey Rent a canoe for as long as you want for groups of 1-4. Prices vary, but R.600 should get you at least a half day trip. Pop into the tourist information centre next to the main Boat Jetty (VCSB/Boat Jetty Road) for advice, or cross over the bridge to enquire at hotels or tour operaters. Kollam/Quilon Visit the DTCP Information Centre by the Jetty on Jetty Road to organise tours in a group of 5 or 6. Half and full day trips available with knowledgeable guides. Kollam to Alappuzha One of the most popular Kerala backwater tours is the cruise between Kollam and Alaphuzha which is an eight hour, scenic trip. It leaves at 10:30 a.m. Tickets can be bought from the DTCP Information Centre, or from the nearby tour operater, and shoud cost between R.350 - R.400. If you decide on this trip, take some bottled water, sun cream and get there early for a good seat - there is a little covered area at the back of the boat downstairs that is nice to sit in. The boat stops for a traditional Keralan lunch and tea, and also at Amma's ashram, where you can disenbark and break up your trip. 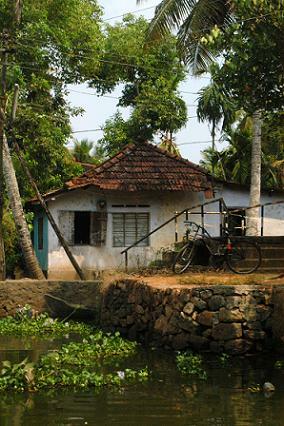 If you do not have accommodation at Alappuzha, there will be no shortage of offers when you arrive. Check the price and distance before you decide to follow any of the touts. Alappuzha to Kottayam This 2 and a half hour trip takes you across some vast lakes, past small traditional villages ad along narrow canals, stopping a handful of times along the way to pick up/drop off passengers. Kollam Return journeys across Ashtamudi Lake leave from the main jetty, last 1 or 2 hours and cost under R.20. Ask in tourist info centres or at the jettys. Look out for kingfishers en route! If you want to see what else Kerala has to offer (and there is plenty!) have a look a our pages about Kerala's idyllic beaches or 2000m high hill stations.